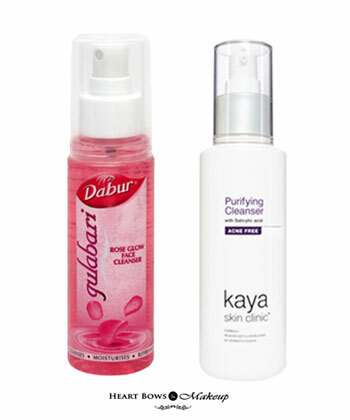 Home » Acne Prone Skin » Best Toner For Acne Prone Skin & Pimples in India: Our Top 10! 10 Best Toner For Acne Prone Skin & Pimples in India: Affordable & Effective Options! Toners are a very important part of a good skincare routine because they not only freshen up the face but also target specific skin problems. A good toner helps control sebum, reduces enlarged pores and preps the skin. Different skin care products are meant to be used by different skin types. Treating acne prone skin can be very tricky hence its imperative to use skincare products suitable for sensitive skin type. 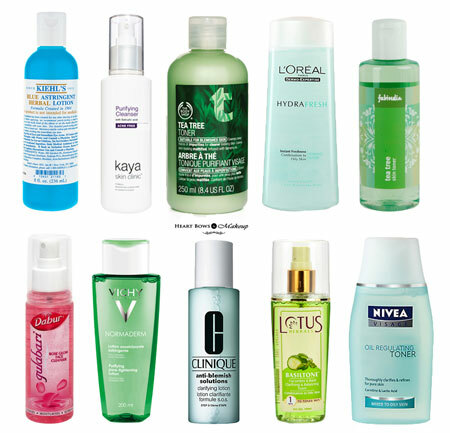 We’ve already listed out the best face washes for acne prone skin in India. After a thorough cleansing, the next step is toning and here the top 10 best toners for acne-prone skin and pimples available in India. Best Toner For Acne Prone Skin & Pimples in India: Affordable Options! 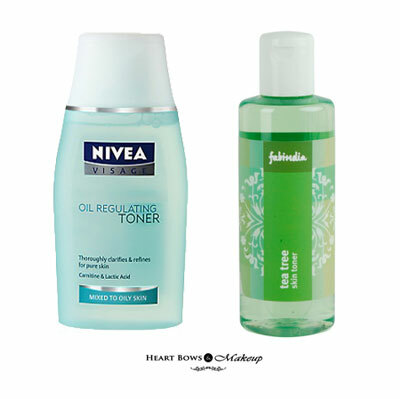 One of the most popular toners in India, The Nivea Oil Regulating Toner is suitable for oily and acne prone skin. It contains a mild quantity of alcohol that helps to reduce the greasiness on the face and controls breakouts. It has a pleasing fragrance and despite containing alcohol as an ingredient, does not sting the skin. If you’re looking for an affordable toner for acne prone and sensitive skin in India, then this is a great option. This is an alcohol free toner suitable for sensitive skin and pimples. It effectively removes excess sebum, dirt and grime. The tea tree extracts help control acne and pimples and also reduce blemishes. The toner contains salicylic acid which is a very effective ingredient for pimples. An affordable herbal toner for acne prone skin and pimples in India that we highly recommend. 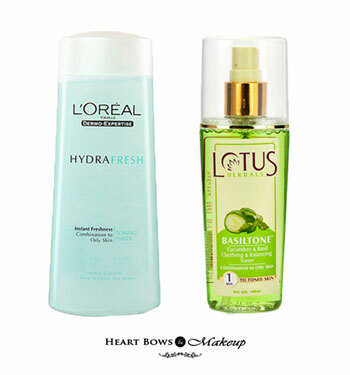 One of the best and effective toners for pimples in India is the Lotus Basiltone Toner. It is infused with basil which is a great ingredient for acne and reduces blemishes as well. In addition to basil, this toner contains the extracts of cucumber that cools and refreshes the skin and also makes the pores look more refined. It adequately removes any residue of face cleanser, sebum, dirt, grime and makeup. Due to the herbal extracts, the toner is great for sensitive and acne prone skin. Easily the best toner in India which is well priced. The Hydrafresh toner is suitable for all skin types be it dry, oily or acne prone. It contains Beta Hydroxy extracts and Hydra-Claryl components along with French Spa water and Pro Vitamin B5 which refines the skin texture. It does not dry out the skin but effectively removes excess sebum and dirt. When used regularly, the toner is effective at minimizing enlarged pores around the nose and chin. Highly recommended. The most economic solution for combating oily skin without stripping the skin off natural oils, is using rose water as a toner. It protects and refreshes your skin while imparting a healthy glow from within. The Dabur Rose Water can also be used as a facial mist and is the most affordable toner in India which is free of harmful chemicals. Its suits acne prone skin and combats pimples effectively. This was also featured in our Top 10 Beauty Products Under 150 Bucks. Kaya skin clinic claims to create products that target specific skin problems. The Kaya Purifying Toner is alcohol-free and thus it removes excess oil without stripping off your skin’s natural moisture. It contains botanical extracts of rose, cucumbers and witch hazel, all of which have refreshing, revitalizing, anti inflammatory and pore refining properties. It is best suited for sensitive skin due to the organic extracts. The toner also contains Mandelic acid that helps to unclog your pores and mildly exfoliate your skin hence it is one of the best budget toners for oily and acne prone skin. 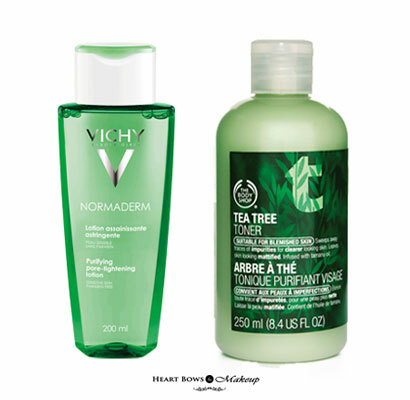 The Vichy Purifying Pore Tightening Toner contains mild amounts of anti-inflammatory salicylic acid that reduces inflammation and helps to cure acne, without drying out your skin. 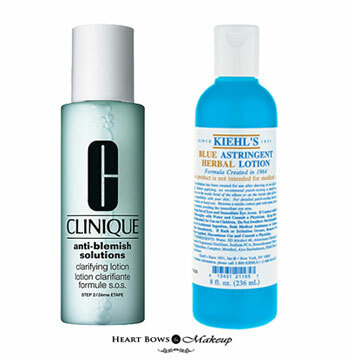 This purifying toner cleanses impurities and reduces the prominence of pores. If you have sensitive and problematic skin then this is one product that you must invent in. A great effective toner suitable for oily, acne-prone and sensitive skin in India. This tea tree based toner from TBS needs to be shaken well before use as it contains certain mattifying- powder components that settle down at the base of the bottle. Tea tree oil has potent antibacterial and anti-inflammatory properties that help to reduce occurrence of pimples. The mattifying components in the toner help remove shine and greasiness from the skin to reveal a fresh and clean complexion. This is one of the top selling toners in India for acne prone skin. The Clinique toner is a gentle toner formulated specially for sensitive and acne prone skin. It helps clear out dead skin cells and reduces oiliness thereby combating acne. It soothes redness and calms down irritated skin. The toner also contains salicylic acid making it more effective for controlling acne. The price is definitely quite high but its a great investment for acne prone skin and pimples. One of the oldest product by Kiehl’s their herbal astringent is one of the best products for acne prone skin. It contains menthol which keeps oil at bay and Sodium PCA which is a natural hemuctant that makes the skin softer. It cools down the skin due to the presence of camphor and is one of the best toners for acne prone and oily skin in India. However, it does sting the skin a bit so you might want to give it a try at the store before buying it. So these were the top picks as the best toner for acne prone skin and pimples in India which are affordable and effective. If you too suffer from sensitive skin then do let us know your favorites below. Best Aishwarya Rai Red Carpet Looks at Cannes: Our Top 15!